This is not just a typical mesh bag for your pole spear. 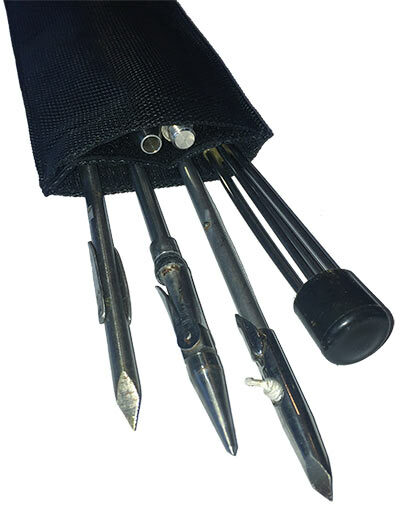 It is a complete storage and solution for your pole spear and your pole spear tips. One size fits all! That’s right, the fastened Velcro strap makes this bag a “one size fits all”. Fits traveler pole spear sections from 22" up to 44" long. NOTE: This mesh bag is made of the same ballistic material the MAKO Ballistic Mesh Dive Bags are made of. These are the toughest mesh bags on the market. You can expect the highest quality when buying direct from MAKO Spearguns. This is a cheap price for a solid product! The Velcro is not cheap and very sticky. The mesh bag is if anything over engineered because of how solid it is. I also like that there are multiple sleeves in the bag and you can retrieve the spear from either side of the bag while the spear heads can be kept in the smaller sections so the don’t bang on the spear. Well built, but the bag is just a little tight and rigid, makes it tricky to get the poles out sometimes as they get stuck constantly. Hoping it will break in. One thing is for sure, the poles aren’t banging around in the bag. Online description is accurate ... do not waste your money on other Pole Spear Carry Bags. Price and quality are great. Well thought out product.